The Entz has an innovative motor that has bands and not metal gears, coupled with a carbon belt makes it truly silent to ride. Combined with an automatic gear hub that provides seamless gear changing. It will revolution the way you ride bikes forever. The Entz project started before the mid drive motor was invented. Our first motor designed with AEG just could not make the torque required. So we teamed up with Brose to bring this stomping 80Nm motor. To make it revolutionary and take the next step we add in the gearless automatic hub, making class leading technology. Smooth is the only way to describe the ride of the Entz. The motor uses bands instead of convential metal gears. The power is then fed through a carbon belt and down to a gearless hub that seamlessly changes the gears while riding. This creates an effortless and ultra smooth ride. The hub can be controlled by a twist grip to find a gear ratio you like or you can set it to automatic and let the computer change the gears for you, much like high performance German sports cars. Added to this the bike is almost silent, in fact it makes less noise then a convential bike. How fast and how far can the Entz go? 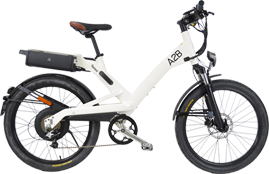 The Entz can reach speeds of up to 25km/h (15.5mph), however you are able to pedal faster. 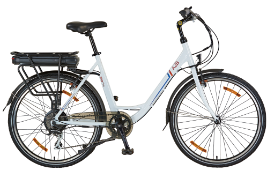 The Entz can assist you up to 100km (62 miles) (the distance varies depending on the weight of the rider and riding conditions). You can choose the level of pedal assistance provided using the control option on the display via the remote on the handlebar. There are five assistance levels ranging from ‘economy’ for maximum range to ‘high’ for a sporty and dynamic experience. A walk assist function allows the bike to travel at up to 6km/h (3.7mph) while you walk the bike in non-cycle areas. The gearless hub can be manually set via a twist grip to find a gear ratio you like. Or you can set to automatic and then select a pedal cadence that you wish to ride at and let the controller sort everything out. The Entz boasts the Brose mid drive which has 80 Nm of torque which is simply class leading. The torque is so high on the Entz that hills will simply not be an issue. In fact when combined with the gearless hub we think you could ride it up stairs too. How do I charge the Entz? To recharge the battery simply plug the charger into any standard outlet and connect it to your portable rear rack battery (either on the bike or off the bike inside). After two hours your battery will be charged up to 80% of its capacity. To complete a full charge will take up to three hours depending on how discharged the battery is at the beginning of the charging process. For the best performance we recommend to charge your Entz battery at least every two months and if you are using it frequently try to use as much of the capacity before charging. The battery should be charged in temperatures greater than 10 degrees and not above 35 degrees. The latest smart phone design display on the Entz includes an indicator which displays how much energy is left in your battery and what distance that remaining power can take you based on the level of pedal assist you choose for your journey. The indicator works like a fuel gauge on your car and will let you know when you are running low and should re-charge. There is also battery indicator built into the battery too so you can check the battery before connecting it to the bike. Can I buy accessories for the Entz?